Tia Simpson is a Flint resident affected by the water crisis in that Michigan city. 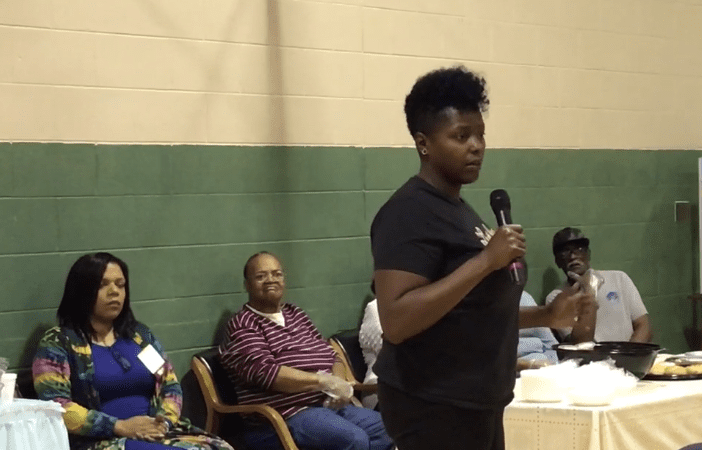 During a media meet-up at a local senior center, she talks about the devastating impact the situation has had on her and why she speaks up on behalf of herself and others. Tia Simpson stood in front of nearly 40 journalists pleading her case for clean and affordable water. The 34-year-old Flint resident endured the aftermath of being exposed to the city’s toxic water and depleting quality of life. She, along with households in Flint, face a challenge that areas similar to the predominately black and poor community face: Having access to affordable and clean water. The fight for water equity for people like Simpson has been a slow one as she, along with others, struggle to pay high water bills while officials say their hands are tied as they work to ease the burden of high water rates for communities like Flint. On average, Detroit’s Great Lakes Water Authority, the system that supplies Flint and other municipalities with water, has raised its water rates 11 percent a year for more than a decade. This year, Flint saw another rise in rates, but city officials have yet to put the cost on residents. The average income for Flint residents is about $26,000 a year. The city has been labeled as one of the most impoverished communities in the nation, yet residents pay the highest water bills in the country. The average water bill in the city is $140 a month, a far cry from neighboring communities. Even if they never turn their taps on, Flint residents pay an average of $60 a month for never-used water. A solution to make water more affordable could be as simple as putting income tiers in place or implementing income caps for communities giving poorer water customers a break from paying exuberant bills, but officials say legislation prevents them from doing so. During a recent Society of Environmental Journalists conference in Flint, Pugh said the city is working to make adjustments for people like Simpson but didn’t reveal details of precisely what officials are doing. Steady promises of plans in works seem bleak for cash-strapped cities like Flint and Detroit as residents face delinquent water bills resulting in property liens, while struggling to gain access to safe drinking water and basic sanitation. It wasn’t until some municipalities left the water authority that they saw relief in water rate increases. In 2014, Michigan officials made a decision to switch the city’s water supply from the water authority to using the Flint River temporarily as a cost-cutting move that eventually exposed nearly 100,000 people to lead-tainted water. The initial promise was for Flint to connect to the Karegnondi water line coming from Lake Huron after it was complete. That never happened. Flint eventually found itself reconnected to Detroit’s water, and the city is now facing a multimillion-dollar debt as residents refuse to pay for water they couldn’t use. Detroit water rates are determined by distance and elevation, meaning the further away a municipality is, the more their water cost. When Genesee County switched its source, Detroit’s water authority lost more than a dozen municipalities. Programs have been implemented in urgent cases where hundreds, if not thousands of residents faced penalties for delinquent water bills. But those programs don’t address the working poor — because they have some money coming in, just not a lot of it — forcing them to find other means to pay their bills. A number of research efforts and case studies have been compiled focused on water equity. A movement in areas like Baltimore, Philadelphia, Pittsburgh, Buffalo and Chicago aim to help residents with inflated water rates with affordability plans, including capping rates at no more than 3 percent of income for low-income families. It is true customers should pay for the water they use. But burdening cities struggling with poverty is not the way through a crisis that can be addressed by willing ourselves to implement income-based solutions that consider the needs — and the dignity — of the working poor. Jiquanda Johnson is a fellow of the Center for Community Change Action and founder of FlintBeat.com.